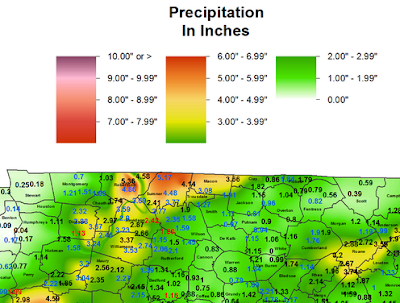 Some very IMPRESSIVE rain totals across this area this past weekend. One of the greatest amounts came from the Fire Dept that is 3 miles SSW of White House, TN in Sumner County. They measured an incredible 6.27" during the Mother's Day weekend event. We 'dodged the bullet' in Putnam County with most gauges around the 1" range.